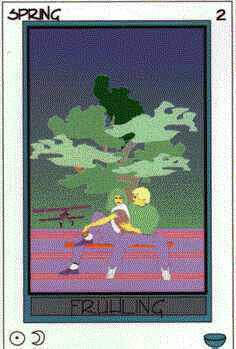 "Seeing with fresh eyes" A flirting couple under a fresh green tree, feet "on the line", depict conventional expression of this energy, the bi-plane just taking off symbolizes new, uncharted ways, exiting vital three-dimensional expressions. Sun/Moon: Emotional body, vitality, exciting experience. Theme for contemplation: Sharpening the sense of newness. Affirmation: "I am in a state of constant growth" Hint: You cannot enter the same river twice. Only our minds keep up the illusion of steadiness and solidity. Recognize the new in your life and greet it with a warm welcome. "Party" Three young women jointly receive the sparkling, refreshing energies of a healing shower. The natural water received by three receptacles on top of the gates to the fountain of youth. A relaxing break with friends, possibly a party, is indicated, a focus on sources inside and outside of oneself to recapture perfect shape, a joint experience. Node/Moon: Common emotions, group feeling. Theme for contemplation: Party Affirmation: "I fully enjoy being alive" Hint: Do you know your places of power? Places you feel drawn to when you need to recover and rejuvenate? Allow the pleasure to enjoy these places and their people. 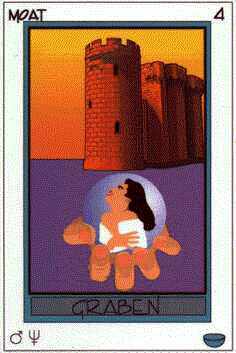 "I know and I don't" A hand presenting a crystal ball, showing a female figure having a seemingly ecstatic vision, symbolizing almost a demand to act on intuition. In the back, castle walls, surrounded by water on all sides, indicate a captured state, captured by dreamlike unclarity. Mars/Neptune: Visionary deed, foggy, unsharp intent. Theme for contemplation: My vision. 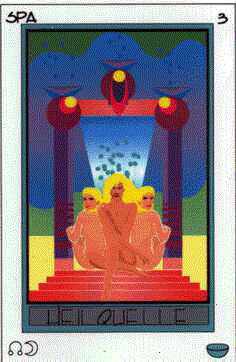 Affirmation: "I have decided and so it will be" Hint: Relax, sometimes it takes half a life to discover one's vision. No need to panic, it will find you.